The art of beadmaking by winding molten glass around a steel mandrel is often referred to as "Lampworking". Early glass beadmakers in Venice used oil lamps as their heat source for melting the glass. Today, it's more common to use a torch that uses a mix of propane as the fuel and oxygen as an accelerant, to get a precise flame that allows you to control the heat in the glass as it melts. Mandrels are steel welding rods. The glass is wound around the mandrel. But, if you applied hot glass to them directly, the glass would stick and never come off. So, the mandrels are dipped in "Sludge", a bead release mixture with the consistency of pancake batter. The dipped mandrels are then air dried, and ready for beadmaking. After the beads are finished annealing in the kiln, the whole mandrel is put in a tub of water to soak, which loosens the sludge, and the bead can be removed from the mandrel, leaving a nice even hole. 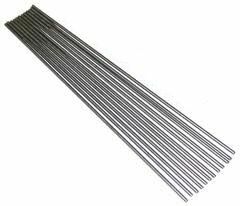 These long round rods are made of high temperature metal and make bead making a snap! Low heat transfer will keep your fingers cools while you wrap molten glass around the other end. Each Mandrel is 10 inches long and comes in a pack of 10. 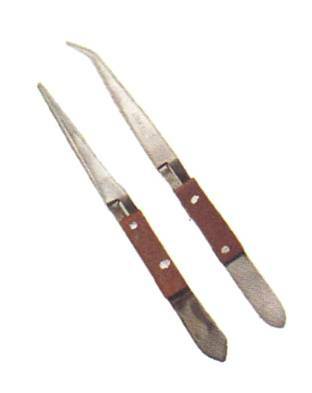 Stainless steel tweezer with fine serrated points. 6.5" Stainless steel tweezers, heat-resistant. Use when soldering or other times when in contact with heat.